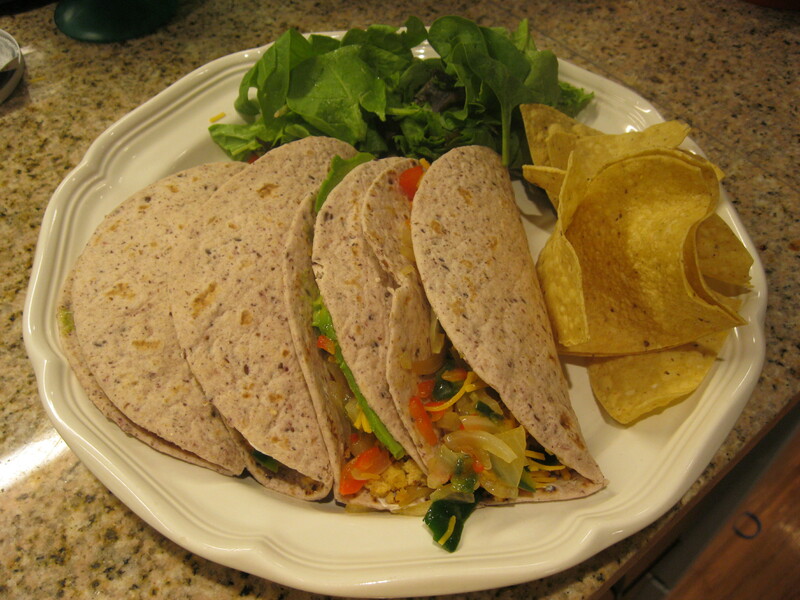 Tofu Tacos were what was for dinner tonight. They were nice enough that B ate all of his! Thor was with Grandma, and so was spared the indignity of being served faux meat. 1. Julie Anne Rhodes taught me that the way to prep your tofu for any kind of crumbles is to freeze, then thaw overnight. The ice crystals breaking down does something to the texture that makes it easier to work with. 2. You’ll be working with hot peppers, so if you are at all like me (forgetful and itchy), wear gloves. You’ll be less inclined to rub your eyes with latex on your fingers. 3. To warm your soft tortillas, put 4 at a time in the microwave for 15 seconds, then flip them and nuke for 15 more seconds. 4. To get the goody out of an avocado, slice it longways, all the way around, then twist the halves until they just slide apart. You can slide a spoon between the skin and the meat, and work it around the edges to pull the meat out whole. Do the same thing with the pit–just work around it with a spoon until it pops out. I learned this watching the guys at Dino’s Subs. You will need 1lb of extra firm tofu (prepped as above), 2tbs of brown sugar, 2tbs of Gourmet Garden Mexican spice (or your preferred taco seasoning), 1/2 each jalapeno, poblano, red pepper (seeded), 1 small sweet onion, salt to taste, 2 Tbs of sunflower oil, 1 avocado thinly sliced, and shredded cheese and sour cream to taste. 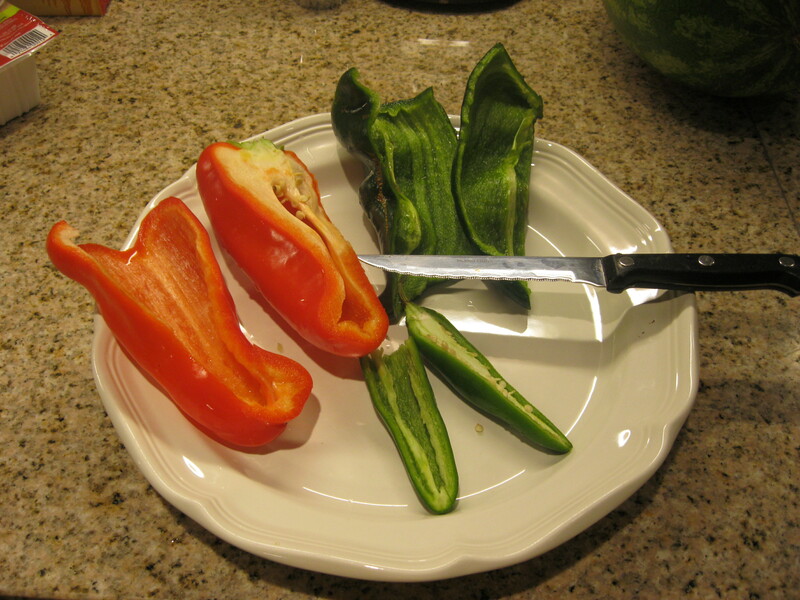 Slice and seed your peppers. Watch your fingers! 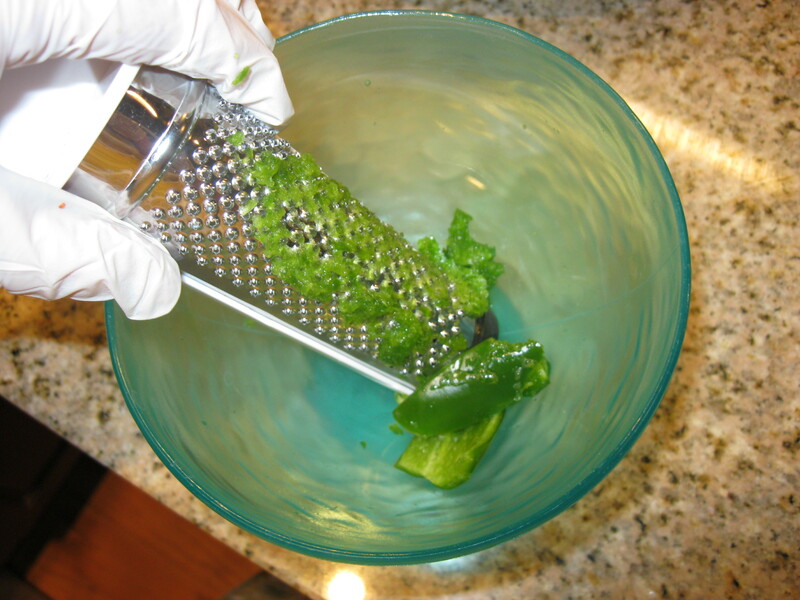 Just the skin of a jalapeno can transfer oils that will make your eyes water for days if you rub it in them. Save your produce bags for little trash bags to use as you go. 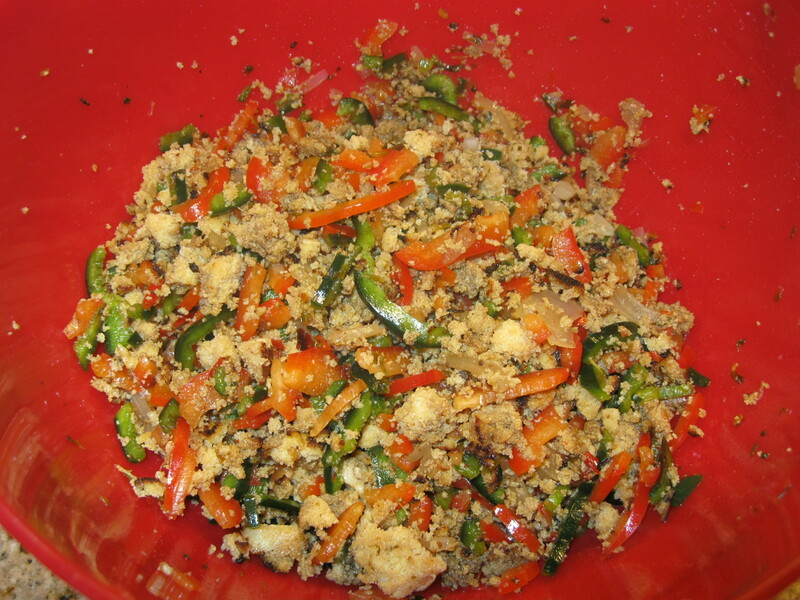 You won’t want to put the pepper stuff in your garbage disposal. I used a nutmeg grater to grate down the jalapeno. I just used half of the pepper. If you want it hotter, use the whole thing. 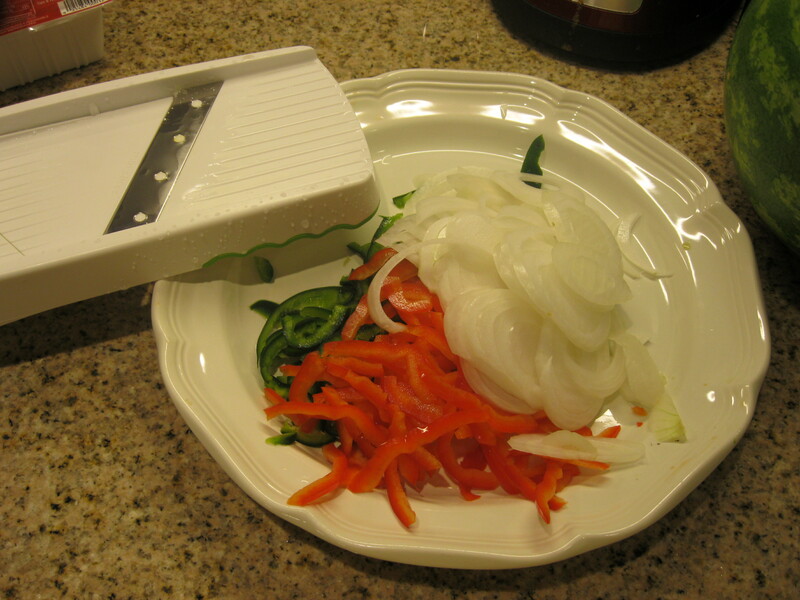 I use my “as seen on tv” slicer doohickey to slice my poblano and red peppers, and my onion. 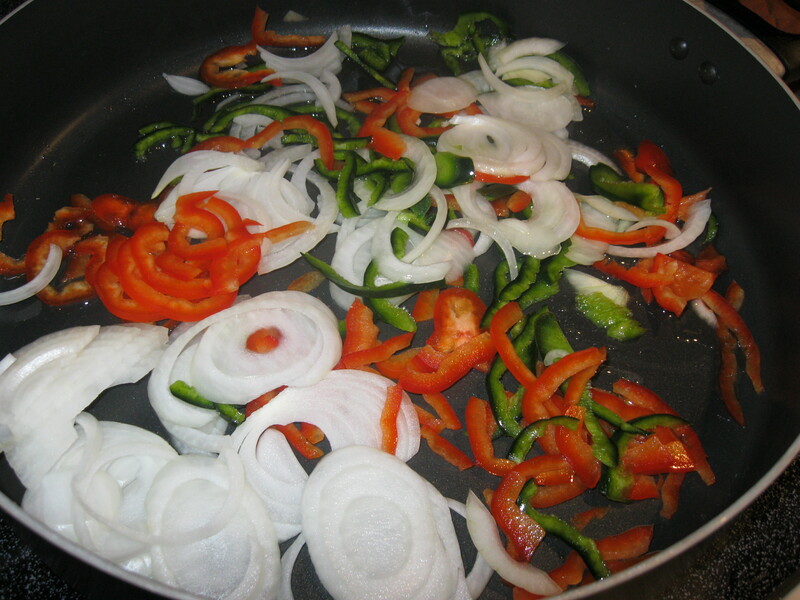 Saute your peppers and onions in 1Tbs of sunflower oil. Onions should be transparent and peppers tender. While your veggies saute, work on your tofu. It is going to be soaking wet. Wring it out like a sponge until it is pretty dry. Then, use your fingers to crumble it into bits until it is the texture of taco meat. I was talking and crumbling and crumbled this a little too much and got a cornmeal texture. 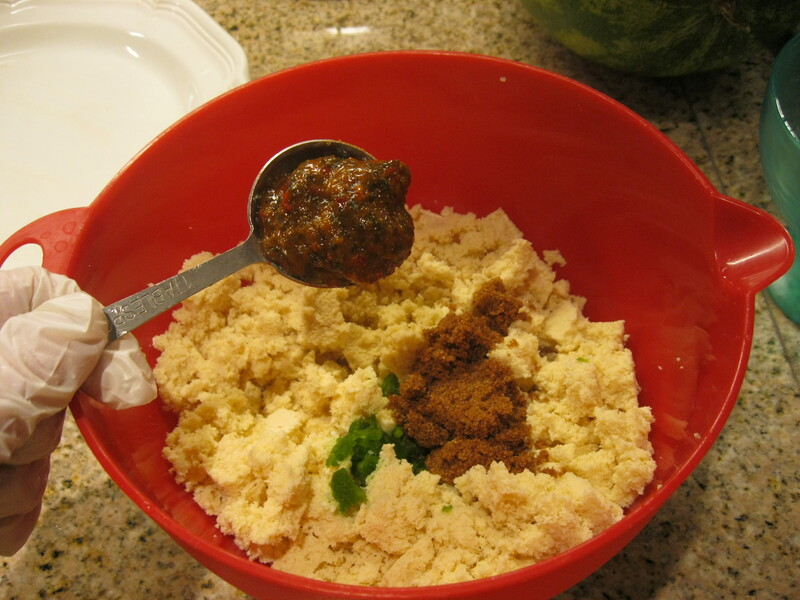 Add your brown sugar, Mexican seasoning, and grated jalapeno to the tofu, then mix, mix, mix. 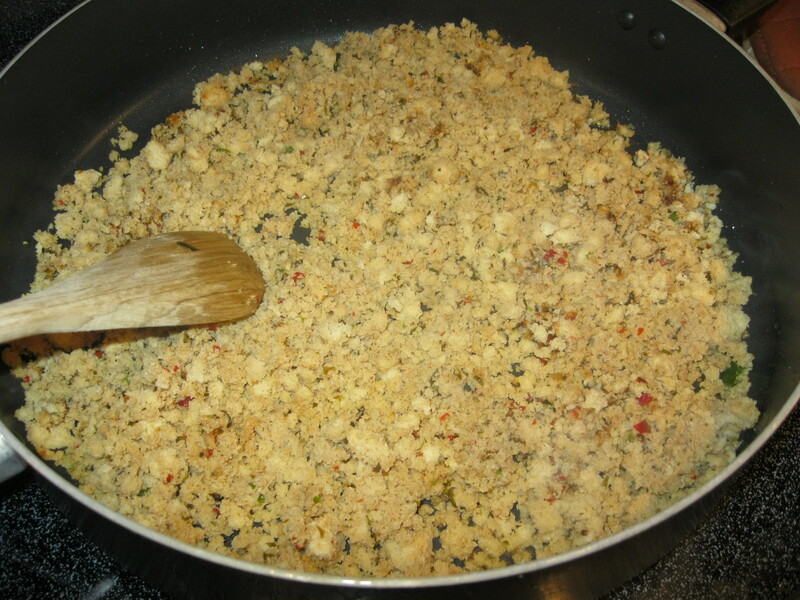 Veggies come out of the skillet, and tofu mixture goes in with its own 1Tbs of oil. 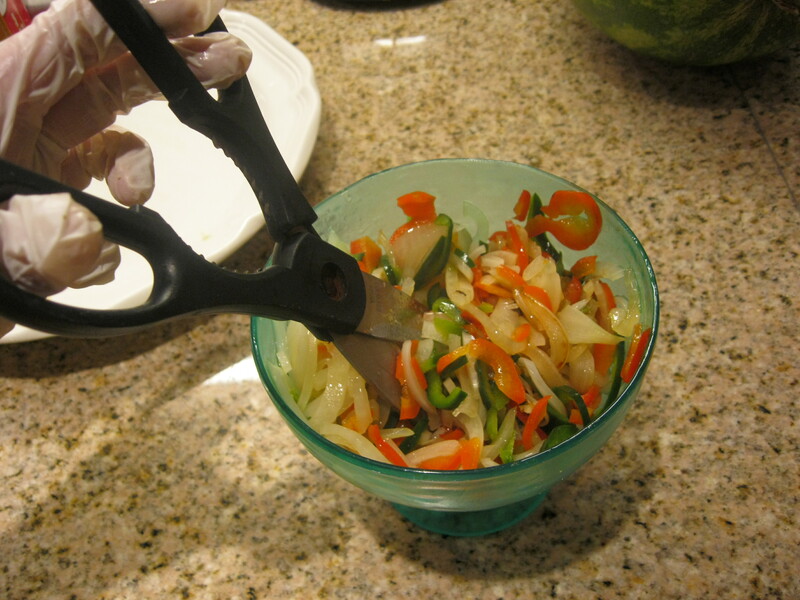 Use scissors to chop up the peppers and onions into confetti. Warm your tortillas. 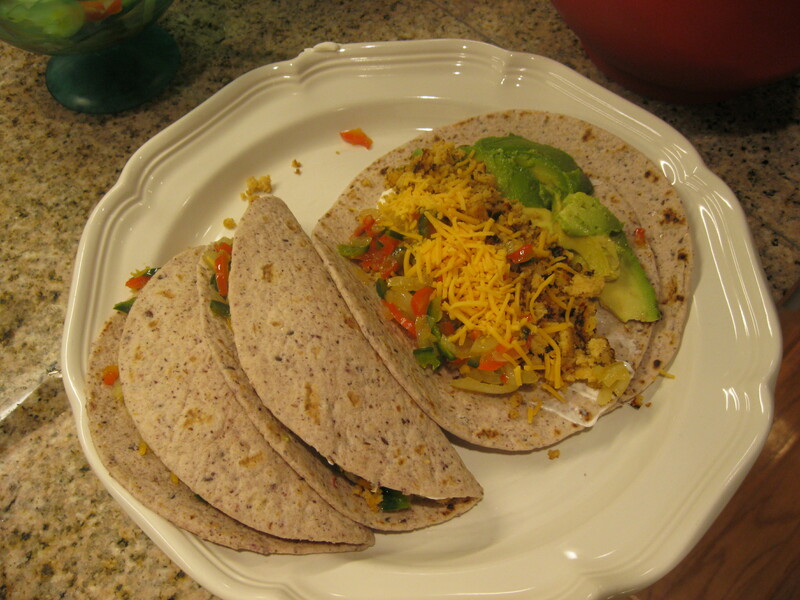 Slap on a little sour cream, add a couple of slices of avocado, spoon in your “taco meat”, spoon on your peppers and onions, sprinkle on a little cheese and fold. Part of tomorrow’s salad. 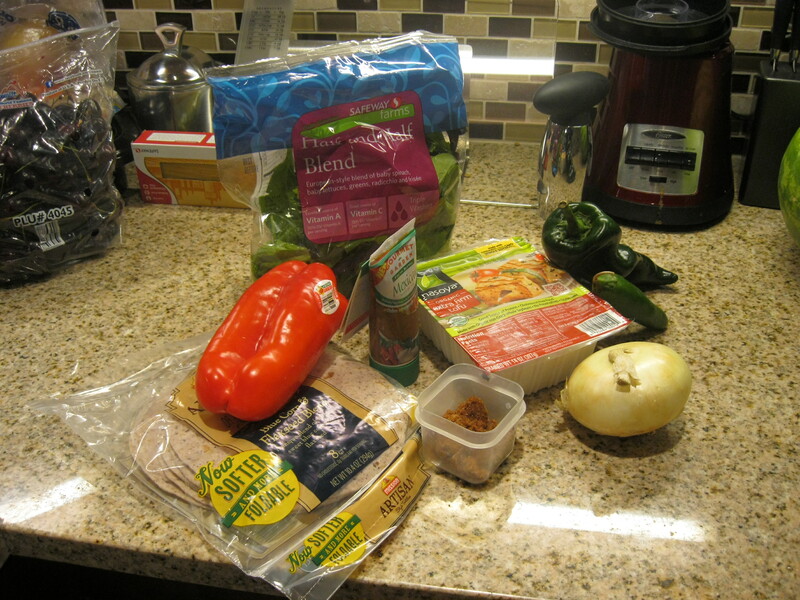 I sliced the remaining poblano and red peppers, and mixed those with the sauteed peppers and tofu. I added about 2 tsp of Balsamic Vinegar and put it in the fridge to let the flavors marinate. Tomorrow, I will serve this over greens with tortilla chip crumbles.